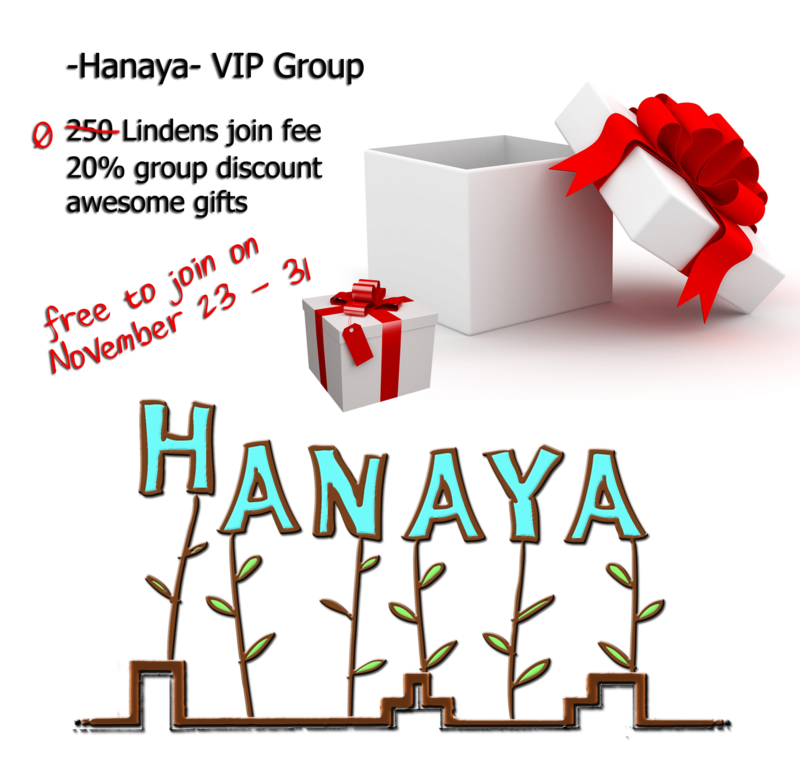 It’s my birthday tomorrow, so to celebrate the -Hanaya VIP group is free to join this weekend, and there is a cute gift available to all. Are there benefits to use up a group slot you ask? There is normally a really cute gift at the beginning of each month, as well as a discount on purchases at -Hanaya- in-world store. This month’s gift are arm floaties and innertubes for all your summer fun. The Arm Floaties are a wearable mesh accessory that include an upright floating animation, which are also scripted to support you in Linden water to keep your head and shoulders out of the water – like they do in real life. And they include a removable re-sizer to ensure a good fit. There are innertubes for single avatars, as well as for a couple. And they are provided in 3 scripted versions. One is for prim water, and two are for LINDEN water. Drop them out of your inventory onto Linden water and they will bob up or sink down and find their own perfect height in the water. Then hop on and either drift gently with the wind, or rotate a little bit in place. So join the group and either grab the gift from group notices, or visit us in-world and get it. Please make sure you activate your group first! And have a fun summer weekend! This entry was posted in Freebies and Gifts and tagged free, freebie, gift, group gift on August 1, 2014 by moriko. This entry was posted in Freebies and Gifts and tagged freebie, gift, rhapsody on July 7, 2014 by moriko. Summer is coming, and with it, the 4th annual Beached Bunny Hunt. A very well organized event by Allie Munro of Grumble, the hunt features 20 sponsors and a total of 58 designers. the Pelee Island Beach Chair. The event starts on June 1st. The beach chair is a brand new, original mesh designed and created by our own Moriko. The chair is 2 li, has materials textures and includes 6 animations, which are custom-fitted to the chair. Three anims for guys and three for girls, which are accessible via a menu. If you get to the end of the hunt, you will also be eligible to participate in a mini-hunt for gifts from the hunt’s sponsors. 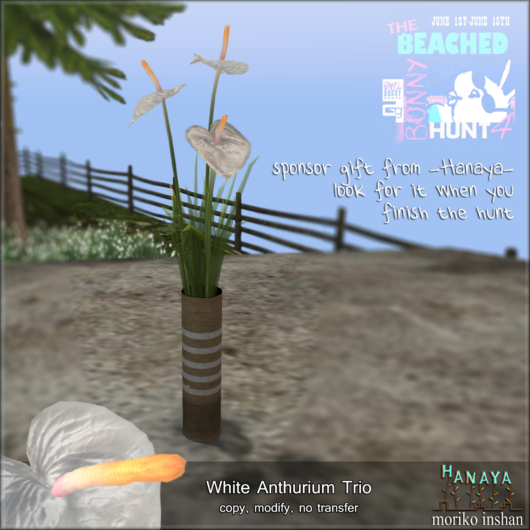 Our sponsor gift is a lovely trio of white anthuriums. The Beached Bunny Hunt 4 starts on June 1 and runs until June 15, 2014. So please come and visit -Hanaya- during the hunt, look for these goodies and maybe check out our nature walk for some cute kawaii art. This entry was posted in Events, Freebies and Gifts and tagged -Hanaya-, freebie, gift on June 1, 2014 by moriko. A Valentine’s inspired group gift is now out at -Hanaya-. Create some romance with our Call Me Sweetheart Couch and Chair – the shiny white lacquer finish of the set is enhanced by a nubby linen upholstery fabric in hues of pink, peach and lavender. Pink roses, babies breath and ivy embellish the vintage frame, adding an old-world romantic feel. The set includes 16 menu-driven animations (12 in the 3-seater couch, and 4 in the chair), so no icky pose balls. And the furniture is copy, modify – like most our products, so rez as many as you wish and modify textures or size as needed. Don’t want the floor shadow? 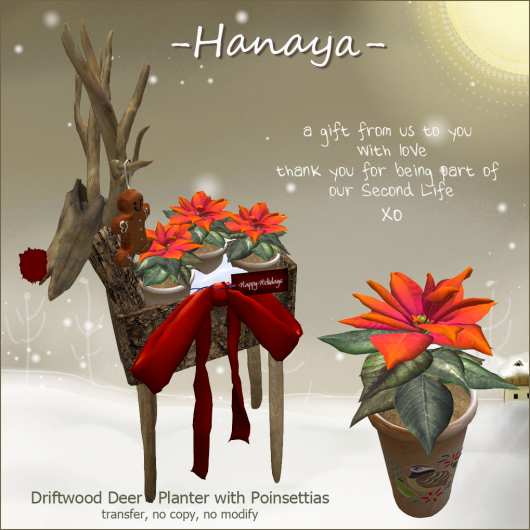 The gift was sent out on the -Hanaya- Yummy Collectibles in-world group today (12 February 2013). If you missed yours, either get it from group notices or stop by our in-world store. The gift will remain available to group members in the Customer Service area until the end of February. This entry was posted in Freebies and Gifts and tagged -Hanaya-, gift, group gift on February 12, 2013 by moriko. 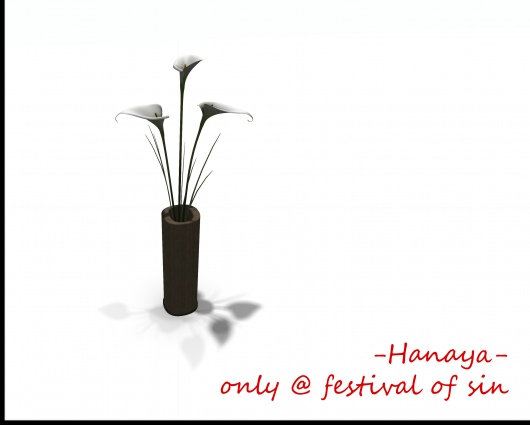 be greedy with -Hanaya- @ the festival of sin! Be greedy! Shop! Shop until you drop! These words were my inspiration for a brand new interactive creation that I made for the Festival of Sin, which starts tomorrow. Which is fitting, since -Hanaya- is in the Greed section of the sim. And when I think of shopping (in real life or in Second Life), I most often think of shoes. A multi-purpose prop to hang out, to use as a prop for bloggers, or as a display for store owners specializing in shoe sales. The brand new offering from our store is the Greedy Princess and the Shoe bed – an interactive piece that contains 8 animations, which can be used simultaneously by you and a bunch of your shoe shopping friends. And of course, after a hard day’s shopping, you can climb the ladder and relax in the shoe bed. If you decide to use this piece in your shoe store, simply rez one of your own shoes for a decoration instead of ours, and have your store models use the animations to model your latest creations. The mesh block letters are separate for those of you that prefer not to have mesh. Another bit of meshy goodness is a gift waiting for visitors to the -Hanaya- storefront at the Festival of Sin. Find us close to the central landing point in the Greed section of the event. The event opens on Saturday, February 18th at 5 PM SLT, and continues until March 3, 2012. A slurl will be posted here when the event opens. This entry was posted in Events, Freebies and Gifts, Product Announcements and tagged -Hanaya-, Festival of Sin, gift, mesh, Second Life, shoe designers, SL on February 17, 2012 by moriko. first, on behalf of my family and myself, let me wish you all the very best of the festive season, and a very Merry Christmas to those of you that celebrate it. Second – and most important – thank you so much for being part of my Second Life over the last year. As you may know, -Hanaya- celebrated it’s first anniversary in November and it has been a wonderful year thanks to all of you. I hope to meet and talk to many more of you in 2012 – if I am in the store or in my workshop below, please stop and say hello. The gift boxes are mod, transfer – so you can stuff your own present in, rename if you wish, then take back into your inventory and give to a friend or loved one as a gift. There are 5 types as shown above, and there are 3 of each type in the box. If you need more, get them from our in-world group notices, or stop by our in-world store and check the Customer Information area (please make sure your group is active). After last week, where I made a number of very low prim new stuffies, I felt like primming stuff up. So I give you the Driftwood Deer Planter, stuffed with 3 yummy poinsettias, embellished with a bow and a gingerbread kiddo. A single poinsettia is also included in case you just can’t spare the prims. Effective January 15, 2012, the join fee for our in-world group, -Hanaya- Yummy Collectibles, will change to 250L. During the 1st quarter of 2012, we plan to introduce a method to allow group discounts on in-world purchases, as well as a customer loyalty program. A second (free to join) in-world group will be setup for those who only want to receive product updates and news. Our Subscribe-O-Matic group will continue to receive product updates and news, with the odd prezzie thrown in. So please have a safe and happy holiday season, have fun and be good to each other. This entry was posted in Freebies and Gifts, News and tagged Christmas, freebie, gift on December 21, 2011 by moriko.